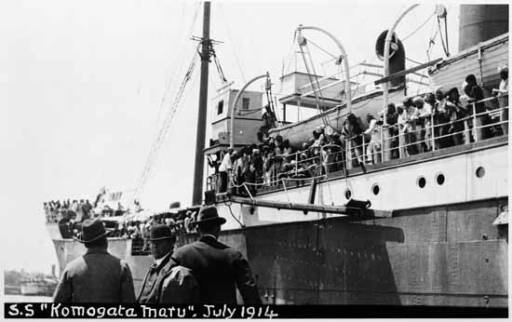 In May 1914, a group of 376 passengers – 340 Sikhs, 12 Hindus, and 24 Muslims, organized specifically to test Canada’s “colour bar” of exclusionary immigration policies, sailed from the Orient for Vancouver on the freighter Komagata Maru. The ship, chartered for the voyage, had been specially fitted out to accommodate passengers instead of her usual coal cargoes. Arriving in English Bay on May 23, 1914, Komagata Maru and her passengers were caught in a tug-of-war between the vessel’s organizers and the Canadian government, who refused to let them land. “We are British citizens and we consider we have a right to visit any part of the Empire,” said organizer Gurdit Singh. The news was picked up by British press. The Vancouver newspaper, The Province, published news report under the heading of “Boat Loads of Hindus on Way to Vancouver” and “Hindu Invasion of Canada”. The news of its departure reached the British Columbia authorities. 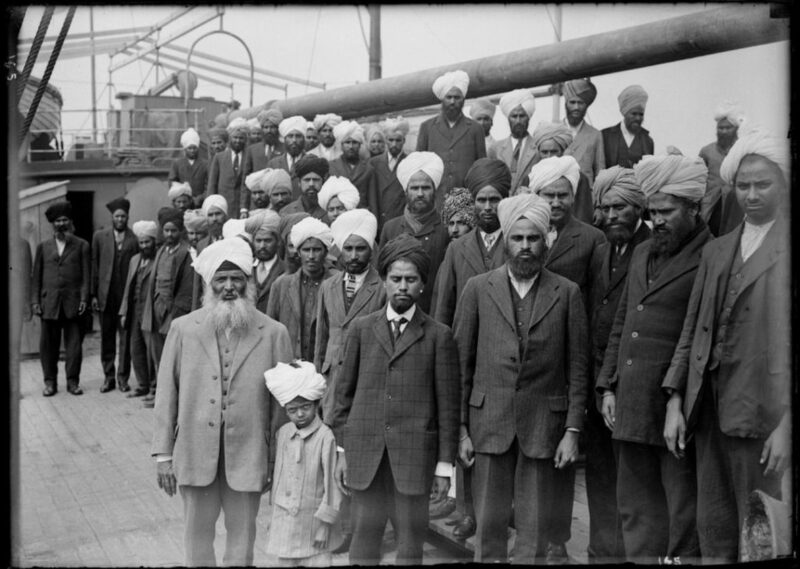 Their instant reaction was that “Hindus would never be allowed to land in Canada.” The Indians who had already settled in Canada had also started to prepare for the arrival of the Komagata Maru. Meetings were held in the Gurdwaras concerning what actions to take. Money and provisions were collected to help the passengers upon their arrival in Vancouver. The entire Indian community in Canada united to fight the opposition. On May 23, 1914, the Komagata Maru reached Vancouver and anchored near Burrard Inlet. Both the Indians and the Canadian authorities had been waiting for it. The Canadians wanted to send the ship back to where it had originated. The Indians on the other side had lawyers, money and other provisions ready to help the passengers. For two months the passengers of the Komagata Maru, the Indians in British Columbia, and the authorities of British Columbia were involved in a heated legal battle. In the end, only 24 passengers were given permission to legally stay in Canada. On July 23, 1914 the Komagata Maru was forced to leave Vancouver harbor and return to Hong Kong. Their main purpose on reaching Calcutta was to hand over the holy Guru Granth Sahib and to see the governor. The journey was long and after numerous threats by the police, they were left with no choice but to head back to Budge Budge. At Budge Budge, they were ordered to board the ship once again. The passengers, led by Baba Gurdit Singh, refused. A policeman attacked Baba Gurdit Singh with his baton but was stopped by a fellow passenger. It was at this point that firing started. Baba Gurdit Singh was carried to safety. But not all passengers were to be so fortunate. Twenty-nine fell victim to the bullets of British officials and 20 died. Here was another senseless massacre of innocent Indians at the hands of the British. This was the tragic end of the passengers of the Komagata Maru.